Online grocery shopping is at an all-time high. Nearly half of Americans, and a staggering 61% of millennials, are buying their groceries online. This market has doubled over the past year. The biggest trend is that traditional brick-and-mortar grocery retailers have been investing on their online platforms on a massive scale. Online giants such as Amazon are playing in the space as well. There has also been a huge uptick in online-only grocery and meal delivery subscription-based companies. Players such as Blue Apron and Hello Fresh are continuing to acquire new subscribers. Annual online retail sales of food and beverages in the US is expected to exceed $20 billion for the first time this year. This is in the context of a food and beverage market that will approach $1 trillion in total in 2018. While eCommerce currently accounts for 2.5% of US food and beverage retail sales, it is estimated to continue to grow rapidly. There are two main challenges in the highly competitive online grocery market. The first challenge is the acquisition of new customers and/or subscribers. We are seeing success in a data-driven strategy to target consumers that match the behavior and demographics of the ideal shopper profile. Identifying appropriate audience segments is often a competitive, but effective approach to acquire high-intent customers to a retailer’s website. The second challenge is to convert first time consumers into loyal, repeat customers. Once the consumer has tried your online grocery platform, it is vital to keep them engaged with relevant promotions and personalized offers. 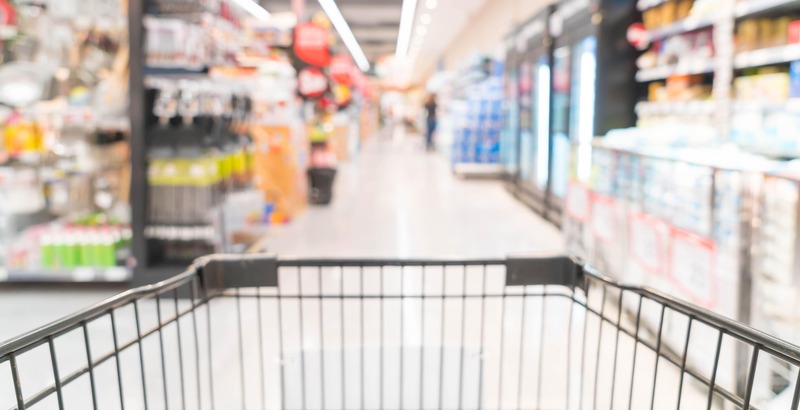 To establish loyalty, we have noticed the importance of providing a consistent brand experience as customers shop onsite, and even if they leave to comparison shop in store or at another grocery retailer. There is a lot you can do from a top-funnel perspective to support your marketing efforts. In the example below, you can see Cybba’s onsite engagement solution displaying as a new visitor hits the homepage of the site. website. The new visitor is incentivized to provide their email address for a discount and free delivery on their first purchase. As the customer’s contact info is added into the CRM, the grocery retailer can market to them appropriately on an on-going basis. In working with several online grocery retailers, we have seen great success in campaigns focused on driving new customers. 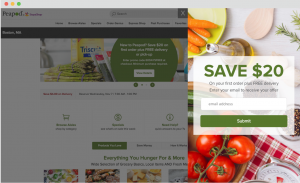 For a leading online grocery retailer, we deployed our onsite engagement and display retargeting products to drive 1,500-2,000 new subscriptions every month. We saw strong results in campaign performance. The conversion rates were increased to 19% for onsite engagement, and .67% for display retargeting. Overall from working with Cybba, the online grocer has seen a significant increase in their website conversion rates. In addition, the retailer benefitted from a more efficient spend by running two solutions on Cybba’s consolidated platform, and accounting for conversions with a single-attribution model.